There are 5 aspects of technology that Indus World School considers as the pillars for improved teaching-learning outcomes and for the School to achieve its purpose and goals. We provide in many cases personalised and preloaded tablets to students used from Grade 4 onwards to improve learning and for solving test papers. We are now working towards bring-your-own-device (BYOD) regime. 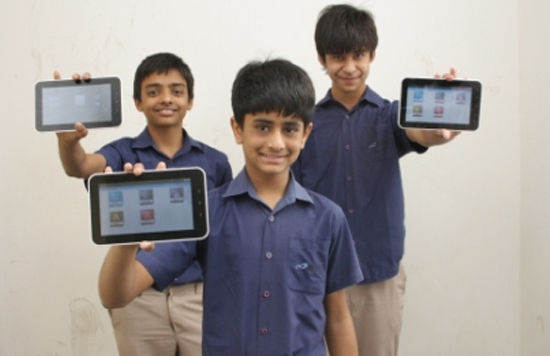 Once implemented, BYOD regime will usher multiple contemporary technologies in the School. 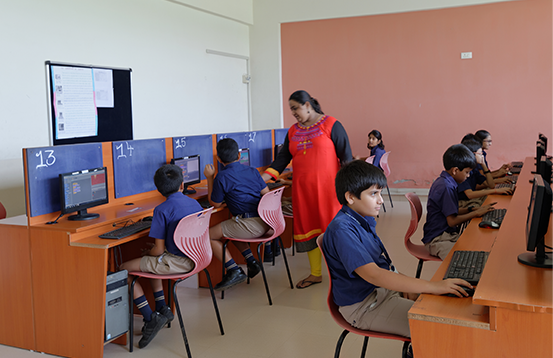 We have well equipped computer laboratories for conducting high end programming and learning. Our laboratories are designed and provisioned for one-on-one computing. Many classes including Khan Academy classes and online tests are conducted in the computer laboratories. All the modules of the ERP have access to different stakeholders depending upon the requirement. The main stakeholders are the students, teachers, administrative and leadership staff, and parents. We have classroom projection technology (commonly known as smartclass) for our teachers and students to be able to project the relevant content in classrooms during the course of classes. We have high bandwidth internet connection and state-of-the-art networking equipment like routers, extenders and repeaters with adequate software and programs to ensure safe computing. Enables students to access Homework / Circulars / resources 24×7. Google drive is used as the core repository to distribute work to the students across locations. Connect students to teachers, Connect to each other, Special interest Groups. Allows the tabs to be completely integrated with student email accounts.